anymore. Today, it spends over $20 billion a year on food imports. itself. What benefits have Africa derived from its military? looters have all been military officers. American help given to post-war Europe under the Marshall Plan. in Egyptian air force and so was Ben Ali. Farming the land with the help of cattle. Washington — The World Bank has rejected a call to suspend its involvement in large scale agricultural land acquisition following the release of a major report by the international aid agency Oxfam on the negative impact of international land speculation in developing countries. "We share the concerns Oxfam raised in their report," the bank stated in an unusually lengthy public rebuttal to the Oxfam Report. "However, we disagree with Oxfam's call for a moratorium on World Bank Group...investments in land intensive large-scale agricultural enterprises, especially during a time of rapidly rising global food prices." "A moratorium focused on the Bank Group targets precisely those stakeholders doing the most to improve practices - progressive governments, investors, and us. Taking such a step would do nothing to help reduce the instances of abusive practices and would likely deter responsible investors willing to apply our high standards," the rebuttal said. Over the past year, aid agencies, local non-governmental organisations (NGOs) and development watchdogs have warned that international investors are increasingly engaging in massive and sometimes predatory land deals in the developing world, particularly in Africa. These acquisitions are partly to blame for rising food insecurity. Food prices are once again nearing record highs. In late August, the World Bank warned that due to adverse weather in parts of Europe and the United States, the global cost of certain staple crops was approaching levels last seen in 2008. Ironically, multinational companies interested in growing food crops to address this need have been doing much of the recent investing. According to Oxfam, however, two-thirds of the investments made between 2000 and 2010 were exclusively for export-oriented crops, while other lands are being used to meet the increasing international demand for biofuels. "Already an area of land the size of London is being sold to foreign investors every six days in poor countries," Oxfam stated, noting that in Liberia, land deals have "swallowed up" 30 percent of the country over the past five years. The report did not reject what good can potentially result from private investment but warned that food-price spikes from 2008 to 2009 led to the tripling of land deals, as "land was increasingly viewed as a profitable investment" even though it largely failed to benefit local communities. "The world is facing an unbridled land rush that is exposing poor people to hunger, violence and the threat of a lifetime in poverty. The World Bank is in a unique position to stop this," Jeremy Hobbs, Oxfam's executive director, said Thursday, noting that the bank both invests in land and advises developing countries. Oxfam is calling on the World Bank to temporarily halt its investments in agricultural land to give it time to review the advice it offers developing countries, and to put in place stronger policies to slow or stop the speculation and "land-grabbing" projects in which it is said to be involved. 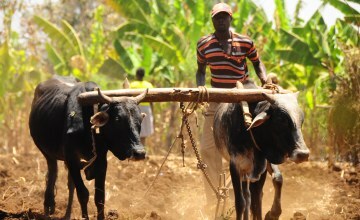 World Bank investment in agriculture has reportedly tripled in the past decade. Since 2008, however, local communities have also brought 21 formal complaints against bank-funded projects that they say have violated their rights. In a way, the bank's response to the call for a moratorium demonstrated outright denial: "The Bank Group does not support speculative land investments or acquisitions which take advantage of weak institutions in developing countries or which disregard principles of responsible agricultural investment." The bank also noted that 90 percent of its agricultural investment is focused on smallholders, and that the agricultural work of its private-sector arm, the International Finance Corporation (IFC), has provided 37,000 jobs. By 2050, it warned, the global population is set to grow by two billion people, requiring a 70 percent increase in global food production. Still, the bank recognised that its massive systems are imperfect and highlighted an upcoming overhaul of related guidelines that would "review and update its environmental and social safeguards policies". "We agree that instances of abuse do exist, particularly in countries where governance is weak, and we share Oxfam's belief that in many cases, practices need to ensure more transparent and inclusive participation in cases of land transfers," the rebuttal stated. The degree to which these safeguards are followed nevertheless remains voluntary, said Anuradha Mittal, the executive director of the Oakland Institute, a U.S.-based think tank that has been at the forefront of recent civil society warnings about the effects of land speculation in the developing world. "Back in 2009 and 2010, we were clearly identifying the role that the World Bank Group has been playing in promoting and facilitating these large-scale investments, completely ignoring the social and economic impact," she told IPS, referring to two reports (available here and here) that the new Oxfam work builds upon. "Oxfam is reiterating that this kind of investment is misinvestment in communities, in agriculture, and unfortunately the bank is choosing to ignore the clear evidence that has been brought forward." Bank officials did not respond to requests for additional comment. Mittal said that the development discussion needs to focus less on prescriptions handed down from multilaterals and more on the national implementation of internationally agreed rights including the rights to food and to free and prior informed consent. "We're not interested in voluntary guidelines coming from Washington or Geneva, but rather in strengthening local and national capacities that help communities work best themselves," she said. "Each country in Africa, for instance, is in a unique situation. So what we need are real consultations at the local level to see what kind of development actually works for the local populations." While Oxfam had called on the World Bank to move to halt its involvement in land deals before the annual meetings between the bank and the International Monetary Fund (IMF), in Tokyo next week, the bank's new president is now suggesting that he will use the meetings to begin pushing substantial reforms aimed at holding the bank's anti-poverty approaches more to account. "If we are going to be really serious about ending poverty earlier than currently projected...there are going to have to be some changes in the way we run the institution," World Bank President Jim Yong Kim, preparing to attend his first annual meetings, told journalists on Thursday. Kim said he would be pushing for a model "where our board and our governors focus much more on holding us accountable for results on the ground in countries, rather than focusing so much on approval of large loans". World Bank involved with massive predatory land deals in developing world, particularly Africa. 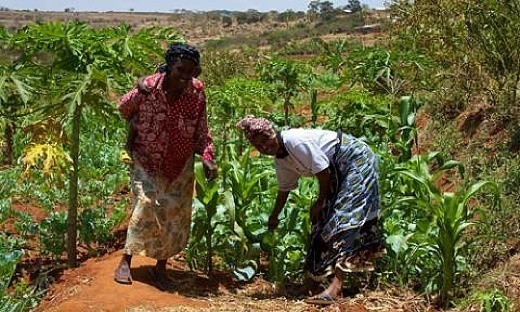 Image above: African women on a small farm serving local markets. From original article. Over the past year, aid agencies, local non-governmental organizations (NGOs) and development watchdogs have warned that international investors are increasingly engaging in massive and sometimes predatory land deals in the developing world, particularly in Africa. “A moratorium focused on the Bank Group targets precisely those stakeholders doing the most to improve practices – progressive governments, investors, and us. Taking such a step would do nothing to help reduce the instances of abusive practices and would likely deter responsible investors willing to apply our high standards,” the rebuttal said. Over the past year, aid agencies, local non-governmental organizations (NGOs) and development watchdogs have warned that international investors are increasingly engaging in massive and sometimes predatory land deals in the developing world, particularly in Africa. These acquisitions are partly to blame for rising food insecurity. “Already an area of land the size of London is being sold to foreign investors every six days in poor countries,” Oxfam stated, noting that in Liberia, land deals have “swallowed up” 30 percent of the country over the past five years. The report did not reject what good can potentially result from private investment but warned that food-price spikes from 2008 to 2009 led to the tripling of land deals, as “land was increasingly viewed as a profitable investment” even though it largely failed to benefit local communities. “The world is facing an unbridled land rush that is exposing poor people to hunger, violence and the threat of a lifetime in poverty. The World Bank is in a unique position to stop this,” Jeremy Hobbs, Oxfam’s executive director, said Thursday, noting that the bank both invests in land and advises developing countries. Oxfam is calling on the World Bank to temporarily halt its investments in agricultural land to give it time to review the advice it offers developing countries, and to put in place stronger policies to slow or stop the speculation and “land-grabbing” projects in which it is said to be involved. Still, the bank recognized that its massive systems are imperfect and highlighted an upcoming overhaul of related guidelines that would “review and update its environmental and social safeguards policies”. “We agree that instances of abuse do exist, particularly in countries where governance is weak, and we share Oxfam’s belief that in many cases, practices need to ensure more transparent and inclusive participation in cases of land transfers,” the rebuttal stated. “Back in 2009 and 2010, we were clearly identifying the role that the World Bank Group has been playing in promoting and facilitating these large-scale investments, completely ignoring the social and economic impact,” she told IPS, referring to two reports (available here and here) that the new Oxfam work builds upon. “Oxfam is reiterating that this kind of investment is misinvestment in communities, in agriculture, and unfortunately the bank is choosing to ignore the clear evidence that has been brought forward.” Bank officials did not respond to requests for additional comment. While Oxfam had called on the World Bank to move to halt its involvement in land deals before the annual meetings between the bank and the International Monetary Fund (IMF), in Tokyo next week, the bank’s new president is now suggesting that he will use the meetings to begin pushing substantial reforms aimed at holding the bank’s anti-poverty approaches more to account. “If we are going to be really serious about ending poverty earlier than currently projected…there are going to have to be some changes in the way we run the institution,” World Bank President Jim Yong Kim, preparing to attend his first annual meetings, told journalists on Thursday. Kim said he would be pushing for a model “where our board and our governors focus much more on holding us accountable for results on the ground in countries, rather than focusing so much on approval of large loans. 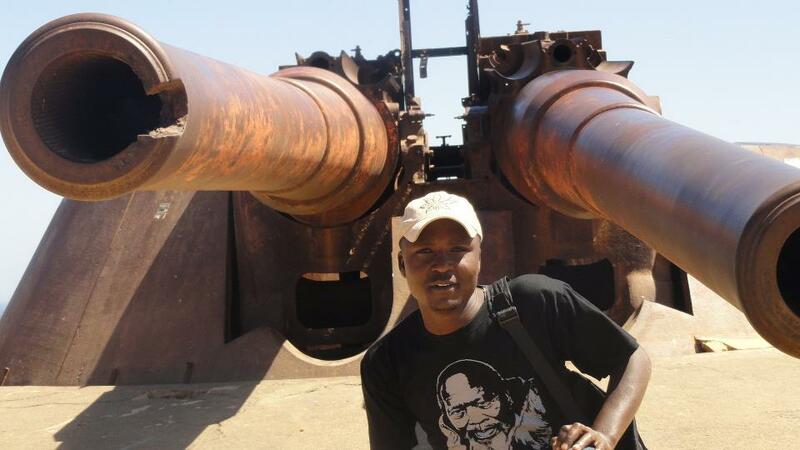 Imperialism is destroying Africa. It is destroying its land, its people, its future. That is the only conclusion that can be drawn from Oxfam’s report Africa: Make or break – Action for Recovery. The report is a stunning indictment of imperialist parasitism; although it ends with an appeal to the governments of the self-same imperialist nations to now reverse their ways, the value of this kind of report should not be underestimated. The impact on health is staggering. Infant mortality rates are 50 times higher than in the imperialist nations. In 1990, an estimated 4.2 million children under the age of five dies from malnutrition. Another 30 million are underweight. 20% of the population are anaemic. African women are 50 times more likely to die during childbirth than women in the imperialist nations. In 1990, two-thirds of African governments were spending less on health per capita than they were in 1980. It is not merely health that has suffered: so has education. Primary school enrolment fell from an average of 78% in the 1970s to 68% in the 1980s. Less than a third of all children attend secondary school. Despite an increase in the volume of exports, their value fell throughout the 1980s, so that for instance cocoa exporters in West Africa increased their output by a quarter between 1986 and 1989, only to see its value fall by a third. The collapse of the International Coffee Agreement in 1989 meant that cocoa prices continued to fall, costing Africa a further $3.2bn between 1989 and 1992. Any future GATT accord on tropical products will intensify this downward pressure. With the decline in export earnings (from $65bn per annum 1981-85 to $55bn per annum 1986-90), the overall debt burden increased. Despite paying out $71.5bn between 1986 and 1992, overall indebtedness rose from $116bn to $183bn. Of this, $l1bn is arrears, up from $220m 10 years ago. So-called ‘cancellation’ and rescheduling such as that adopted by the Toronto Agreement have saved little more than $10bn. Meanwhile, the IMF alone drained $3bn between 1983 and 1990: like· the World Bank, it will not reschedule nor cancel debt. Imperialism has sucked Africa dry. The rate of return on foreign investment fell from around 30 percent in the late 1960s to 2.5 percent in the 1980s. The result: total private direct investment in 1990 was a mere $1.1bn, and is now little more than 0.6 percent of total worldwide foreign direct investment. Even this sum was offset by repayments of $1bn to commercial banks. The latest twist is that as Africa becomes less and less self-sufficient in food, it has become a dumping ground for heavily subsidised EC and US agricultural exports. Thus in Burkina Faso, EC grain is sold for $60 a ton, about a third lower than locally produced equivalents: this low price is guaranteed by a Common Agricultural Policy subsidy of $100 per ton. Likewise, the EC exported 54,000 tons of subsidised maize to Zimbabwe, which then had to sell its own stockpile under World Bank advice at a huge loss, leaving it without any strategic food supplies when it was hit by the 1992 drought. Whilst the EC and the US spend over $20bn annually on subsidising agricultural over-production and export subsidies, the net effect on Africa is to undermine local agriculture, increase unemployment and increase dependence on food imports. Meanwhile, the environment becomes ever more degraded, mainly because of the increasing use of cash crops as a means of generating export income. Fragile grasslands and forests have been turned over to the growth of timber and cocoa, forcing nomadic herders onto poorer grasslands which have suffered intensified erosion. The result is increasing desertification, further reducing any chance of agricultural self-sufficiency. War and famine have been increasingly the lot of millions of African people since Reagan and Thatcher sought to roll back the tide of national liberation struggles. Mozambique and Angola, Ethiopia and Somalia, the lives of millions have been part of the price that imperialism has exacted through its local stooges. The Financial Times, in a disgraceful editorial review of the Oxfam report (29 April 1993), sought to pin the blame for the deepening crisis on the continent on indigenous governments - their corruption, or their 'excessive' arms expenditure, or their 'socialism' (Nyerere's Tanzania receiving special mention). But the corruption is a necessary part of neo-colonialism: it is the basis on which the comprador bourgeoisie can arise, prepared to sell the rights of their people to imperialism, provided they receive their cut. Oxfam has been continually attacked for its exposure of the effects of imperialism, earning the particular hatred of the Tory government, and an attempt to place its political work outside charitable status. As communists, we disagree with the hopes it has that Western governments may be persuaded to adopt a Marshall Plan to regenerate Africa. But as communists, we recognise that the information it gathers on the impact of imperialism, the humanism it shows towards imperialism's victims, puts it head and shoulders above the bulk of the British left. Africa: Make or Break - Action for Recovery Oxfam UK and Ireland, May 1993, £3.95. Available from Oxfam House, 274 Banbury Road, Oxford OX27DZ.